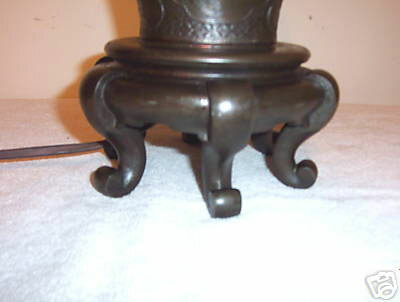 Here for your consideration is perhaps the most rare of the rare Handel lamp bases. This base is shown in the Handel Books with the 18" Mt. Fuji shade and others of the top flight Handel shades. Very heavy six footed with 3 Hubbell sockets and acorn chain pulls. The patina is original and excellent. Has been rewired for safety. On the body of the base are two sections with bamboo trees, one with bird in flight and one with flowers. 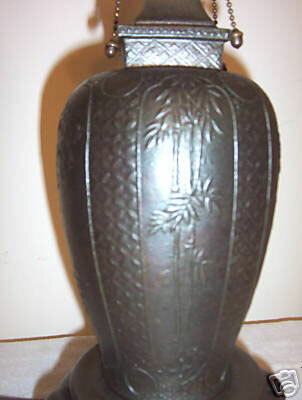 Measures 24" high and 8.5" at the widest part. 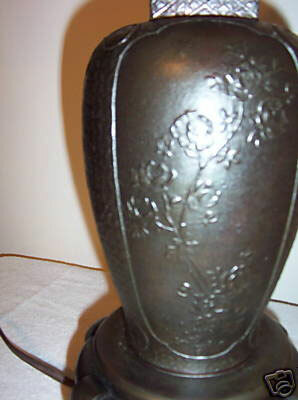 Has that really cool oriental flare and is described in the Handel book as "bronzed metal bulbous base molded with flowers, with the foot molded as a Chinese stand." A very rare and special fully signed Handel lamp base.